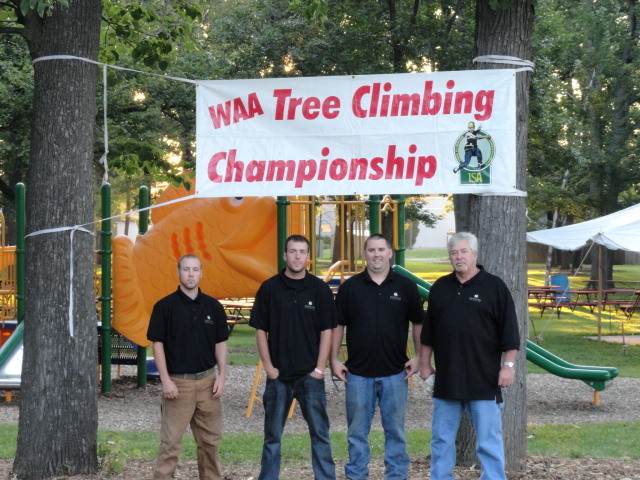 Northern Clearing, Inc. has participated in the Wisconsin Arborist Association’s Tree Climbing Championship for the first time this year. The event, held on August 19, 2011 at Klipstine Park in Ashwabenon, WI, is Wisconsin’s premier tree climbing event and draws competitors and spectators from across Wisconsin. Wisconsin’s premier tree climbing event! After receiving an invitation to sponsor this event from its organizers, NCI saw it as an opportunity to donate to a good cause, raise our brand awareness, and train some of our key employees. 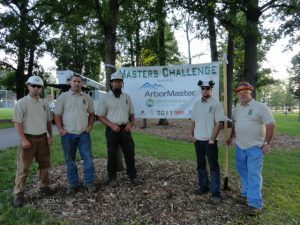 We sponsored the Master’s Challenge event and donated one of our new International trucks with an Altec 70′ boom to set the climbing equipment. In addition, one of our General Foreman, Jim Bruner, harelped judge the Footlock Competition, and four of our employees, Tom Gregoire, Jake Casey, Craig Kunze, and Steve Bailich, assisted in setting and retrieving all of the climbing gear set in the trees for the competitions. The event turned out to be a great experience for our crew that attended the event and also a success for Northern Clearing as a company. Many attendees of the competition learned about NCI’s vegetation management services and were highly impressed with our sponsorship, new equipment, and talented employees. Northern Clearing looks forward to sponsoring more events like this in the future and is working on having employees not only assist in the competition, but compete as well.